Answer: What's my mother's maiden name? When I was talking about this search challenge with a friend yesterday, I described the solution I had. "But.. that's cheating!!" he said, annoyed at my solution. Hey, these are "open internet" problems. As I keep saying, nothing is out of bounds when doing these kinds of research pieces. But why did he think I was cheating? 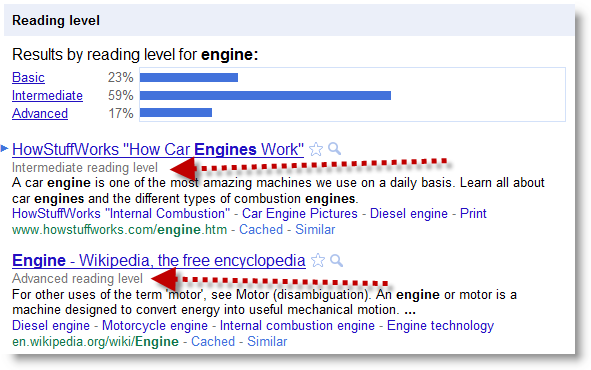 Answer: Because I couldn't find any solution by using just the regular search engines. I had to go to Ancestry.com to solve the problem. Yes, Ancestry.com is a major subscription-based (meaning, you need to pay for it!) online repository. HOWEVER (and this is one of my two key points for today)... I did this research at my public library for free! Yep. The Palo Alto public library has a subscription to Ancestry.com and you can go do everything shown below for free. Since it was raining yesterday, I just stopped by my local branch, sat down for 5 minutes, and was done. If you don't know the data exists, you're never going to find it. I know, I know--it's very Zen koan-like. In this case, though, you knew the research question was genealogical, so you should be thinking "what genealogy resources do I know about?" And Ancestry.com should spring to mind as one of the biggest resources available. and quickly came up with only one plausible person... and mother... and mother's maiden name. 2. Sometimes a library is your best friend. As a society we have made a huge investment and commitment to having a publicly funded institution for information and literate access. Public libraries make many different kinds of information freely available for the public good. My advice to you is to learn what they have and what's possible there. The libraries aren't perfect--they're not as comprehensive as they could be and have their own limits, but they're great resources. Sometimes knowing the right place to look can make all the difference. In a previous installment of SearchReSearch we saw how Gene Golovchinsky looked up Daniel Tunkelang's surname. This time we're going to do something similar, although a little easier than "Tunkelang" -- in this case, the Search Challenge is to figure out MY mother's maiden surname. I pose this challenge for a couple of reasons. First, to suggest that finding this kind of information is so easy you should NEVER use "mother's maiden surname" as a security question. And second, just to illustrate once again that knowing how is more than just a matter of typing a couple of words into Google. Web credibility classes in Santa Monica and Santa Barbara next week! As you know, one of the things I do is to teach classes outside of Google. Next week we have a few classes coming up -- here's the rundown. Will be held at Google's Santa Monica office on Monday, Feb 28, 2011, from 6 - 8PM. We'll work through plenty of examples and give some examples of lesson plans you can use in your teaching. And please feel free to send this to any of your colleagues who might be interested in attending. Remember: this is the SIGNUP sheet. I assume if you sign up, you'll be coming by! Hope to see you all on the 28th! This class will meet on Tuesday, March 1, 2011, from 6 - 8PM. Hope to see the rest of you at UCSB! Answer: Who made the Mountain View horse? which gave me lots of interesting results (who knew there were so many horse statues in the Bay Area? ), but nothing of much use. I poked around a bit more, but nothing was popping out at me, so I took another approach and looked in Google Images. My strategy at this point shifted to a realization that many people now take photos of things (like attractive statues) and geo-locate them, so I had a reasonable expectation that this approach would work. and discovered multiple images of the same horse (handily, even taken at sunset, so I knew which way would be west). I clicked on the first horse (upper left) and was taken to a Flickr page. Fantastic! 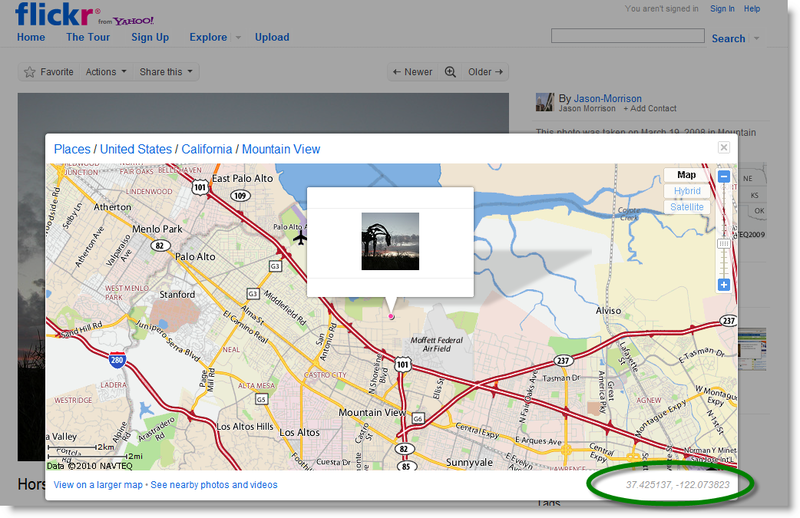 I know that when a Flickr photo has a geolocation, you can click on the map to get the exact location shown on a map AND in the lower right corner, the lat/long! (See the green oval in the following image.) This would let me verify the location. Sure enough, this lat/long shows up very near the Google campus (actually in Shoreline Park, but within an easy walk). Jason Morrison, the photographer, has also handily tagged the photo with "bronze" "Google" and "Shoreline" (referring to the park where it's located). Alas, the sculptor's name isn't in the tag list. How do I figure this part out? I went back to the original Image search and kept looking for other photos of the horse. In a case like this, you sometimes have to make a sideways jump to get to where you're going. At this point I know the horse is made of bronze, and I have the exact location. Maybe I can extrapolate from some nearly matching images! In the second row of the image search results is a sculptural grouping of two horses that look pretty similar in style to the horse in question. Maybe those were done by the same person? 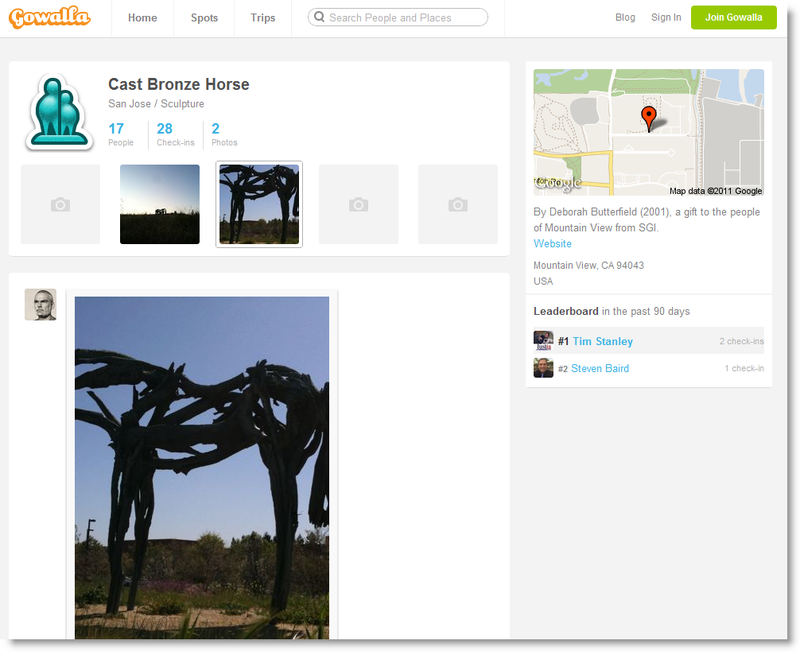 takes you quickly to the first result, which says that the horse WAS made by Deborah Butterfield for the city of Mountain View. But being a skeptical kind of guy, I really wanted Deborah Butterfield to say that it was hers. So I kept looking, and found a few more suggestions (sketchbooks with images of the horse attributed to Butterfield, things like that, but nothing authoritative). I'm willing to believe it's Deborah Butterfield, partly because I found three different sources all attributing the work in Shoreline Park to her, and partly because in looking through multiple catalogs, I see that this style of work (doing the original in driftwood, then disassembling the piece to re-cast it in bronze) is her hallmark. Other artists make driftwood horses (there's an entire community of driftwood art! ), but relatively few remake their originals in bronze. I also happen to know ground truth (because I ran over there yesterday and looked at the base of the statue, which gives the sculptor's name), but the way described above is how I answered the question. 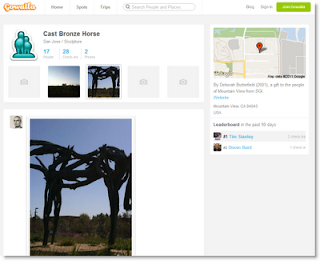 Wednesday Search Challenge (Feb 16, 2011): The horse statue near Google? I'll tell you a little secret: Near one of the Google buildings in Mountain View is a statue of a horse. 2. What is the horse statue made of? 3. Can you find a picture of the horse taken towards the west so you can see what angle the head is held at? Why all these funny challenge questions? Answer, I really like the horse. And besides, when I took my daughter there on a little walk a while back when she was 10, she recognized the style of the statue and gave me the sculptor's name. I couldn't do that. Can you? 4. Who is the sculptor? 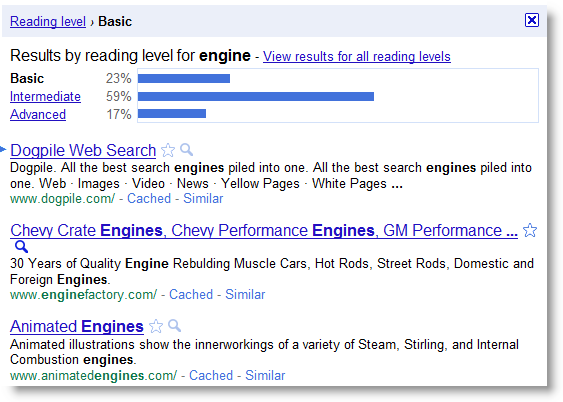 Filtering your search results by reading level is now built into Google search. 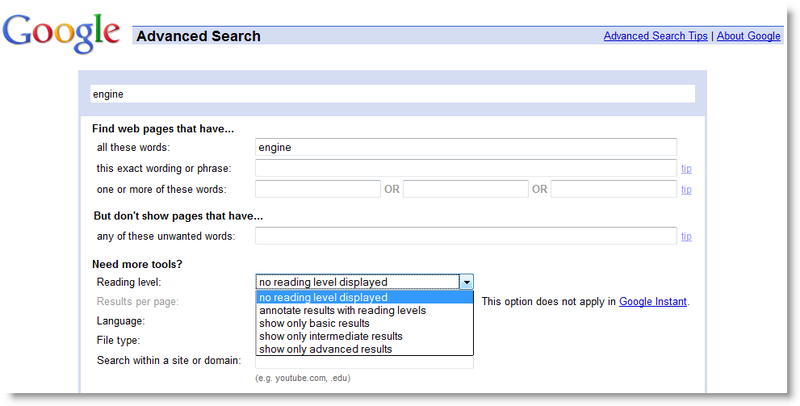 To do this, just click on Advanced Search and then click on "Reading Level," this will then show the popup below. The option "Annotate results with reading levels" inserts a gray text indicating what our reading-level grader thinks that web page is at. Note how the first two results are at very different levels of difficulty. You can, of course, select just the reading level you'd like to see: Basic, Intermediate or Advanced. In this case, all the results are Basic. So... what's "Basic" versus "Intermediate" versus "Advanced"? The reading-level is based primarily on statistical models we built with the help of teachers. We paid teachers to classify pages for different reading levels, and then took their classifications to build a model of the intrinsic complexity of the text. 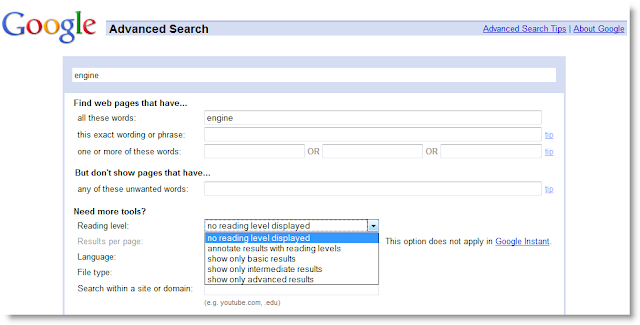 With this model, we can any webpage with the model to classify reading levels. We also used data from Google Scholar, since most of the articles in Scholar are considered advanced. Keep searching (basically, intermediately, or advancedly... your choice)! Answer: What was the conference that took Chopin away from Warsaw? When reading about the life of Chopin a few years ago I'd read about this trip, but never knew much about it. It seemed like a pivotal moment, but I wanted to know more! How to find out? I already knew that in September of 1828 the 18-year old Chopin went to Berlin with a family friend, Feliks Jarocki, a man who was managing the biology museum at the University of Warsaw. But why did they go? What was the motivation? From the Wikipedia article on Chopin I found that Jarocki traveled to Berlin to attend a "scientific conference." Fine. But WHAT was the conference? Finding this wasn't immediately obvious, but the query [ Chopin Jarocki Berlin ] (just cutting the query down to the essential parts) led me to a Google Books result... the Letters of Chopin! In his letter to his friend Tytus Woyciechowski from Sept 9th, 1828, the young Chopin describes "The King of Prussia has empowered his university to invite the leading learned men of Europe for a session of naturalists with the famous Humboldt as its president..."
And with a quick search in Books for [ Chopin Jarocki Berlin ] you can quickly come across a treasure trove of letters and commentaries on his letters. Another great resource are his letters, collected and commented upon by Marucyc Karasowski (published 1906) -- Page 44 identifies the conference as the "Naturalists Congress" as led by Alexander von Humboldt. It's fascinating to learn the Chopin wrote a letter nearly every day. These were often fairly short, but not quite as brief as our modern emails... and fascinating to read this portrait of daily life in central Europe in the mid 19th century. The search moral? Books are your friend... especially for questions like this, of history and the interplay of people and events. Wednesday Search Challenge (Feb 9, 2011): What conference gave Chopin a reason to leave Poland? 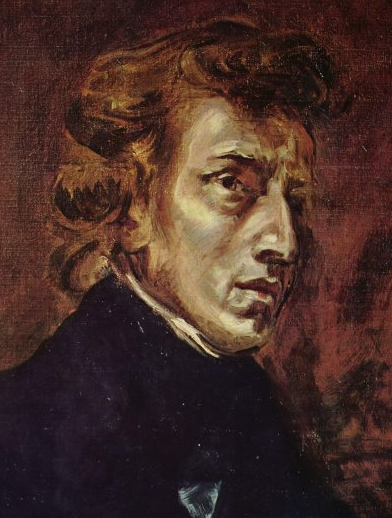 Frederic Chopin is one of the world's greatest composers of piano music. He's my piano-hero and the object of adoration by pianists around the world. Chopin's early life is fairly well documented, and yet it still contains some interesting puzzles for the searcher. This is really a multi-part search problem. First, when did Chopin leave Poland for the first time? And what scientific conference gave him the opportunity to leave? Can you figure out the story? It's an important point in Chopin's young life because it gave him his first chance to hear opera performed outside of Poland and to get a glimpse of the possibilities of life beyond Warsaw. My strategy to find this out was fairly straight-forward. How will you discover it? Answer: How do I change the little blue light on my ThinkPad? Regular SearchResearch reader Hans gave a superb answer to the Search Challenge about the ThinkPad light. Nice job! quickly found the term "ThinkLight" on the Lenovo ThinkVantage design page. leads to a number of forums about ThinkPad repairs, all of which make the point that the ThinkLight is actually part of a subassembly, the "LCD Cable." A quick Control-F search in this PDF file and I found the installation procedure on page 125 (with a nice diagram illustrating how it's done). Search Moral: Multi-step problems like this often require finding the correct term in order to be able to search for the right kind of thing. In this case, we needed a "hardware maintenance manual" (rather than the "repair" manual, which turns out to be a general guide to laptop maintenance). Note that this terminology is peculiar to Lenovo; other companies will probably call their maintenance manuals something slightly different. 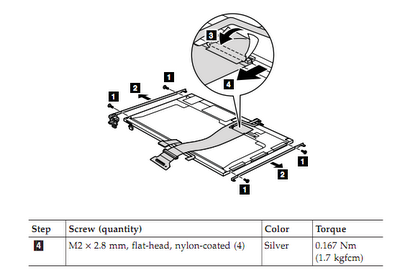 Wednesday Search Challenge (Feb 2, 2011): How do I replace the little blue light on my ThinkPad? Can you figure out how to replace the little light on a T400?? Obviously, I don't want to have you actually tell me how to replace the light, but if you can find the web document that tells me how to replace it, that would be perfect.